Thanksgiving is very close to the first night of Hanukkah this year, which means both holidays are simultaneously on my mind! Last week I came up with a fun little dish that combines the two holiday traditions into one tasty treat– Sweet Potato Coconut Chremslach. Chremslach (singular: chremsel) is the Yiddish word for a fried pancake, and it can appear in many different forms. The most popular chremsel is a pancake made of matzo called bubeleh. Chremslach can also be made from potatoes. Potato chremslach are very similar to latkes, with one major difference. Instead of shredding the potatoes, as we do with latkes, the potatoes are mashed and made into a thick batter before frying. Matzo or breadcrumbs and eggs can be added to bind the batter and keep the pancakes from falling apart. Chremslach often appear on deli menus as “potato pancakes,” and can easily be mistaken for latkes. While latkes are thinner and crisper due to the shredded texture of the potatoes, chremslach are more fluffy. 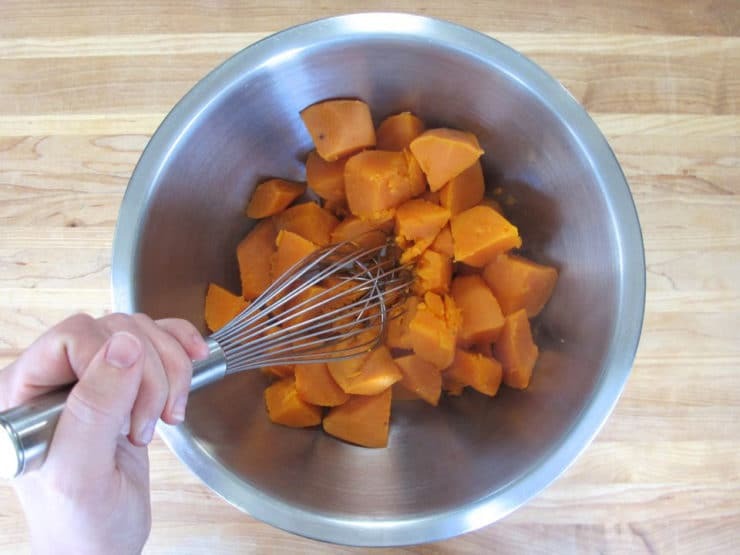 Sweet potatoes (the orange yam variety) are always part of our Thanksgiving menu, while chremslach and latkes are a traditional part of our Hanukkah celebration. Because Hanukkah is on the heels of Thanksgiving this year, it seems fitting to combine the two dishes into one. 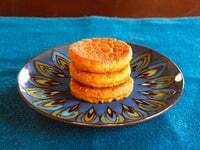 There are many sweet potato pancake recipes out there, some veering to the sweet side and some to savory. I decided to take it in the direction of sweet with a touch of exotic spice. Garam masala gives it an Indian twist, while coconut adds a subtle nutty depth. The result is a delicious little pancake that is crispy on the outside while soft and fluffy on the inside. 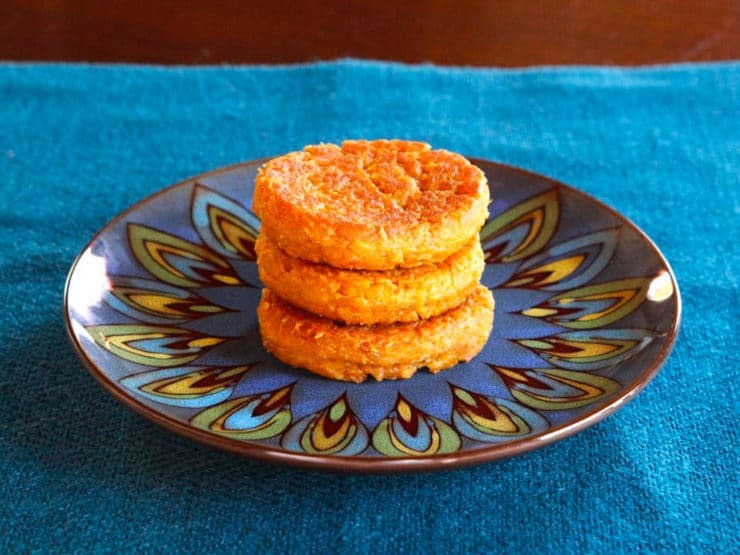 Crisp and fluffy sweet potato pancakes with coconut, spiced with garam masala for a delish holiday treat. Hanukkah, Thanksgiving, Thanksgivukah. 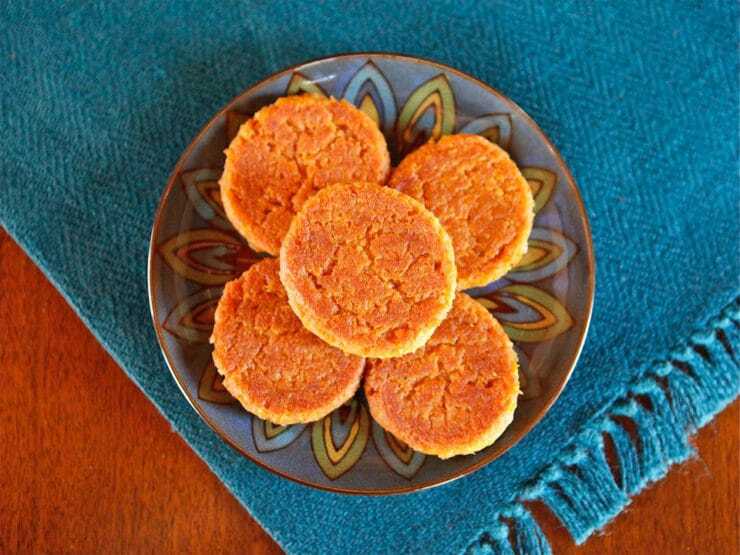 Kosher Note: If you want to keep this recipe dairy free, use margarine instead of butter and make sure your other ingredients are kosher certified pareve. 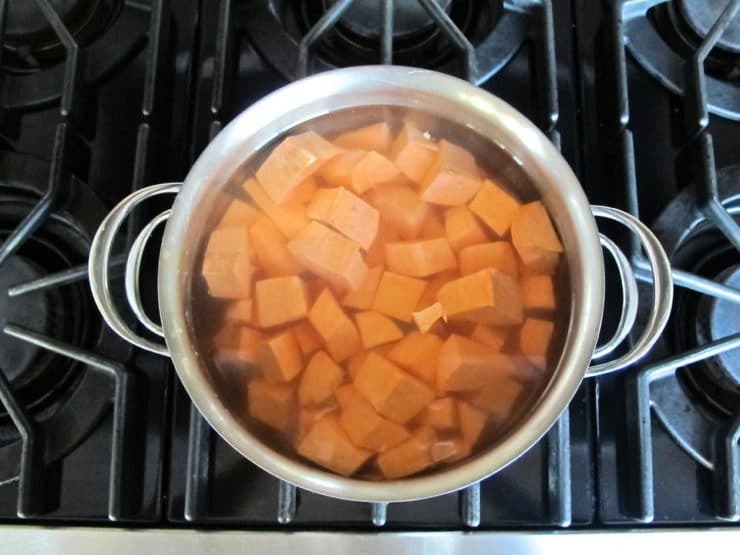 Cut the sweet potatoes into small chunks, then immerse them in water and boil them for about 30 minutes until tender. Drain them well and blot them with a paper towel to soak up excess moisture. Mash the potatoes in a large mixing bowl with a whisk. Add to the bowl the coconut, beaten eggs, brown sugar, sugar, melted butter or margarine, salt, spices and bread crumbs. Mix ingredients until they are well blended. 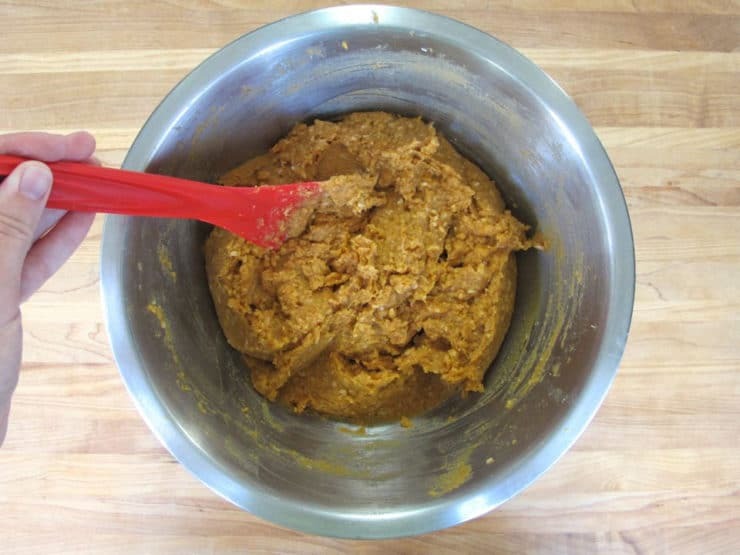 Allow mixture to sit for 5-10 minutes so that they breadcrumbs can absorb the moisture. 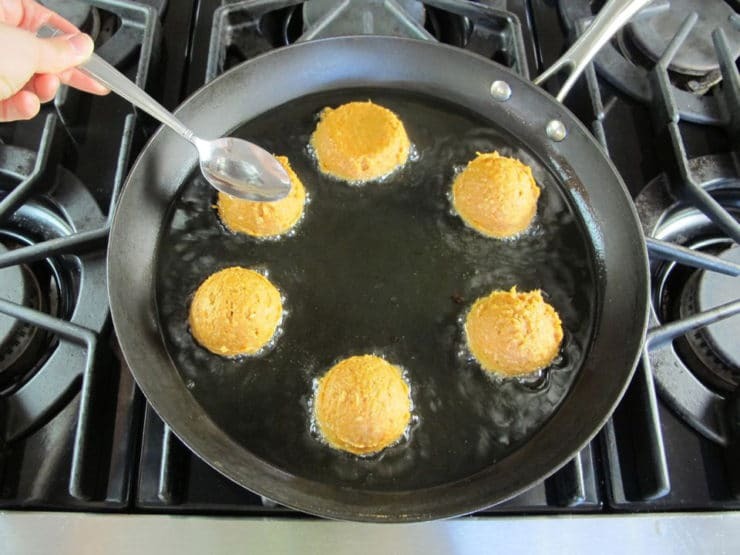 Heat oil over medium low - medium; you will need about 1/4 inch of oil in your skillet for frying. 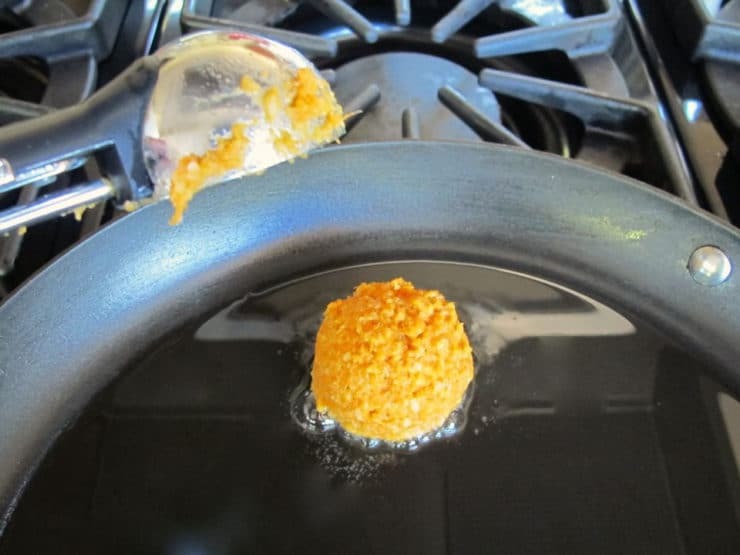 Heat the oil until it reaches 275 degrees F-- use a candy thermometer to measure heat. If you don't have a thermometer, test the oil temperature with a piece of bread. If the oil sizzles and the bread browns in 60 seconds, it's ready. With an ice cream scoop or greased measuring cup, scoop 1/4 cup of the potato mixture and carefully place it into the hot oil to fry. Repeat until there are 5-6 patties in the frying pan. Do not overcrowd. Carefully dip the back of a spoon into the hot oil and gently flatten the tops of each patty, otherwise the batter will stick to your spoon. Alternately you can spray the back of the spoon with a bit of non-stick cooking spray. 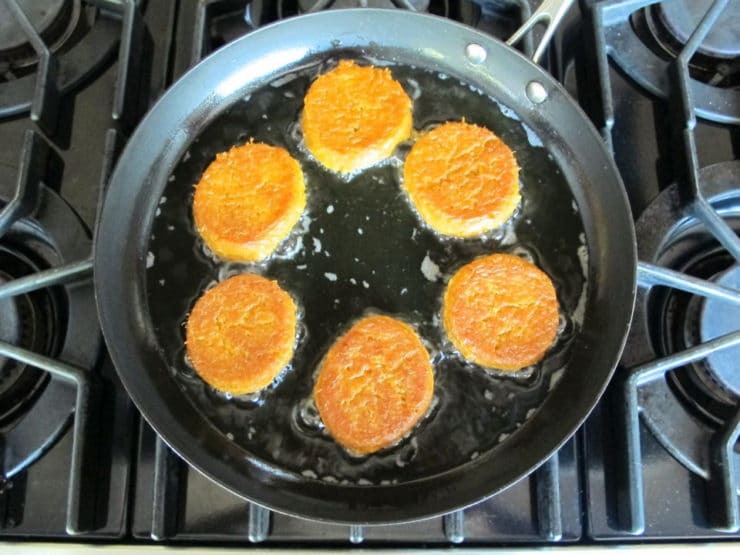 Fry the patties for 4-5 minutes on each side until nicely browned and cooked through. Place on a cooling rack to drain and cool, or on two layers of paper towels. Continue to fry the patties in batches. Serve immediately. Note: If you'd prefer not to deep fry your chremslach, they can also be fried in a non-stick skillet lightly coated with oil. They won't turn out quite as pretty and the exterior won't be as crisp, but they'll soak up a lot less oil. Hi Tori, I am not Jewish but I grew up with a Jewish friend and her family. I just love all cultural foods and Jewish dishes have been a staple for many years. Her Mom was full jewish and her Dad was Irish Catholic, so it was a beautiful mix in that household. The one thing in that house was that no pork was ever allowed and most everything was kosher. But Holidays were celebrated on both sides, so their kids grew up experiencing everything as did I luckily. (I was there most everyday, over-nights, dinners, you name it lol). But I have found some scrumptious additions here and can’t wait to give them a go, especially the sweet potato latke and this sweet potato coconut chremslach! My mouth is watering just thinking about it 😉 Thanks for sharing. I want to make these for Pesach but I’m not sure what “garam marsala” is or where to find it? Garam masala is an Indian spice blend. It is becoming more popular now, and should be found at most specialty markets– even Target carries the blend. If you are celebrating Ashkenazi Passover you may want to check ingredients, as garam masala usually contains cardamom, which some Ashkenazi Jews consider kitniyot. These look delicious. Can they be made ahead and frozen? Is there a way to ensure that they turn out perfectly if I so choose to do this? Hi Allison, Tori’s assistant Ashley here. You can freeze these for a few weeks if you need to make them far ahead. Fry them and drain the oil, then place them in single layers separated by wax or parchment paper in an airtight sealed freezer bag or Tupperware. When ready to reheat, place them straight from the freezer onto ungreased cookie sheets and cook them 400 degrees F for 10-15 minutes till heated through and crisp. You can also line the cookie sheets with brown paper to help soak up some of the excess oil. Never refrigerate, it makes them mushy. I substituted ground flax soaked in hot water for eggs, and unsoaked flax meal for the matzo. That makes them gluten-free and lower carb. I also used leftover tsimmes that no one seemed interested in eating, left out the sugar to compensate for the dried fruit, and fried them in coconut oil. Next time I’m going to try baking them in the oven on a non-stick sheet. Shalom! I’ve just discovered your blog…looks like there are so may tasty meals to try. I look forward to trying your pumpkin challah recipe- yum! What brand of coconut oil do you use? Also, is coconut oil kosher by default? Mrs. Cox, no product is kosher by default unless it’s a natural, unprocessed product like a fruit or a vegetable. Even then, strictly kosher people will do a thorough check and cleaning for insects to determine if the fruit/veggie is kosher or not. That said, there are many packaged kosher products on the market. You can find out if a product is kosher by looking for the hechsher, which is a kosher sign. This sign varies by kosher agency, but the most popular one is an O with a U inside for the Orthodox Union. OMG these sound SOOOOO GOOOD!!! Thank you so much for this awesome recipe! Happy Thanksgiving! This looks so yummi — I can’t wait!!! They look so good. Have a wonderful Thanksgiving.